Such a week I've had! Looking at the last 6 or so postings, it's been quite a week. A couple of new products, some large jobs completed, and an argument of sorts with Yahoo Groups. I played around yesterday afternoon with some scenery effects and I very pleased. First was wild flower blossoms in the long grass east of Jarvis. I used a few of the colours from Scenic Express and very lightly scattered them on top of the static grass. I had sprayed cheap hair spry before hand for adhesive and it's holding rather well. Feeling emboldened, I tried another idea I had. There was a bit of an ugly line under the RoW fence so I hid it with some tufts of Poly Fiber and some red blossoms. I think it works. The row of generic shrubbery along the backdrop needs to be extended more to the left, I know. Maybe tomorrow. Then it was tree planting time. My favorite, Super Trees. And here I tried another new thing for me. Behind the tree line, I tried a technique from Lance Mindheim. I used strips of a sanding medium, Mirlon, to add depth to the tree stand and soften the edge. I really like the effect. Now to add RoW fences and telegraph poles and add the final ballast on this stretch of main. I'm thinking tomorrow will be a scenery day after I get back from the post office. If you've been following this blog, you might recall this posting, http://elgincarshops.blogspot.ca/2013/08/can-you-say-unit-train.html. Well today the other 12 got packed and will be in tomorrows mail. There were some trials building these cars, I don't mind saying but I'm certainly ready should anymore come my way. 24 coal gons! That will make for an impressive train. I just finished building an HO Mullett River caboose kit. While I've built a few of his O scale caboose kits, this was the first HO kit I've done. The kit is every bit as good as the O scale offerings. Just not all the detail that one can have easily in O scale. The laser cut plywood makes for a very solid and stable car body and everything goes together just like it should. Looking forward to doing more of these. Recently I was contacted to create a piece of promotional material for a grain handler in the Mid-West. They wanted models of their leased 67' Trinity hoppers with the addition of the logo and the full name on the side. Fortune was on our side. Walthers have a large array of Trinity hoppers available. I chose a style that had minimal lettering to remove and ordered 6. With the cars in hand, I lightly sanded the factory lettering down and painted over the affected areas. This is where having a wife with a good eye comes in handy. We had gone to the local military modeling shop and chose a grey that matched the factory paint job. Gotta love Model Masters paint! With the cars painted I applied the custom decals I had created by a friend. I'm very pleased with the end result and I expect the client will be as well. BTW, 67' covered hoppers are huge! 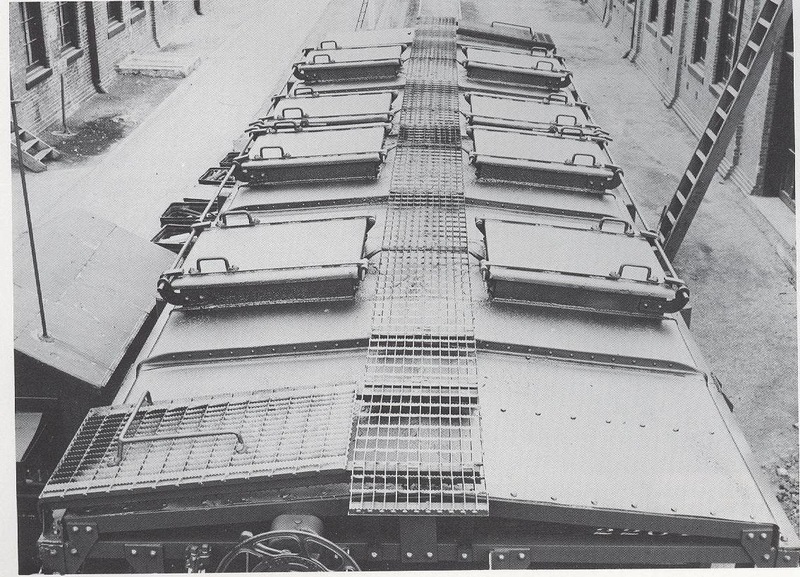 A full description of the AC&F 1958 cu ft covered hoppers is available in the RP Cyc #27. The version we are offering is on a "Murphy" style roof. Over 950 were built for 13 different railroads. Some had the open side configuration and some the closed side option. The roads using this car were, ATSF, CIL, D&RGW, DMIR, DPCX, EJ&E, GN, I-GN, LS&BC, M-I, M-K-T, MP. And it appears the CB&Q built a version in their shops which was very similar to this car. Built in the CB&Q Havelok shops I believe. How about a sneak preview? These are the first samples of our new etched running boards. The first 2 etched running boards are 0.012" thick, closer to scale thickness and the Morton is 0.015" thick. The detail is as close to scale as the etching process will allow, in fact we managed to bend the "rules" for etching with these running boards. Brake steps will also be part of the parts we'll be offering. I suspect that initially the running boards will be offered in some boxcars we're working on, but they will be available separately eventually. Something for you to look forward to. I now have a few of the ACF covered hopper roof mini-kits available to ship. And will have more after Christmas. The mini-kits will sell for $15.00 USD ea. Contact me for postal rates. With the hullabaloo at Canada Post these days, it's tricky to predict their rates. How many can you use? Say hello to our latest detail part. Etched replacement stirrups for the Intermountain PFE reefers. These won't snap off like the factory supplied plastic ones. They will be available soon through the Yarmouth Model Works website http://yarmouthmodelworks.com/. 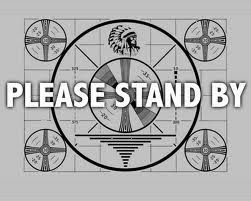 If you can't wait for the webmaster, contact me direct via email pierre.oliver@start.ca and we can work from there. The fret has enough for 2 cars and sells for $3.00. More etched stirrups for plastic cars are in the offing. Stay tuned. But the ends justify the means. Have a look at my buddy Aaron's latest effort. Doesn't register well in the first image. But with a little low angle illumination the effect starts to register. Our next resin kit offering. The Wabash 12 panel welded boxcar. We're trying to replicate the panel warping that occurred when the steel sheets were welded together. That's the beauty of resin casting, you can recreate these kinds of effects fairly simply. I certainly like the results. 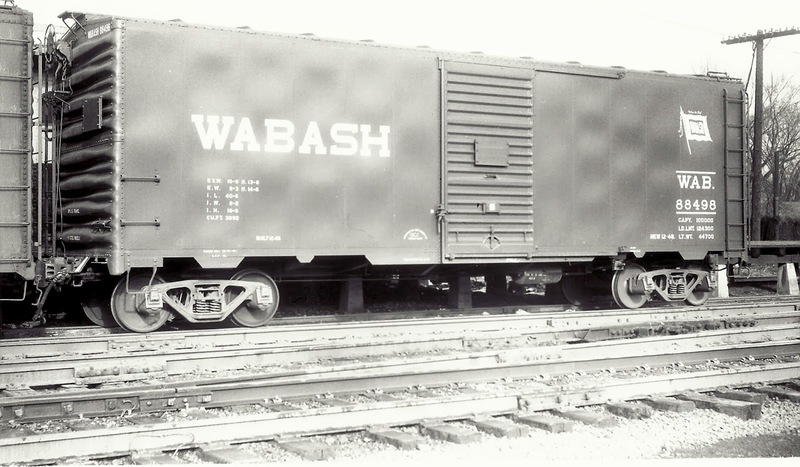 Built in 1948 by AC&F, 400 of these cars were added to the Wabash roster. Not a large fleet by any imagination, but an interesting car that could easily have roamed the continent. The kit, when ready, will also feature another new item from Yarmouth Model Works, all new etched running boards. The etched running boards are correct thickness and have finer detail than we've been used to in etched running boards. I hope to have the beginnings of the pilot model for show in Springfield/Amherst this coming January. And here they are in their finished glory. 4 series 1 CNR 8 hatch reefers decaled and weathered and ready for service on the layout. Built between 10/39 and 4/40, the first batch of reefers were painted mineral red with white lettering. All of the early series cars were shopped and repainted into what is seen here. The red leaf was applied up until 1946 when it was replaced by the green leaf with the tilted herald. Given that I model 1951, I felt that it was reasonable for both leafs to be represented. Makes for a nice mix of colour in the consists. I find that light coloured cars can be trickier to weather than "brown" cars. And most of the images I have of these cars in service indicate that they were kept in good condition. Understandable when you consider what went into the cars. So I exercised a little restraint with the weathering. After they were flat coated a wash of black india ink thinned in alcohol was applied. Really caused the details to pop out. I then sprayed a very thin Railroad Tie Brown down the rivet lines as well as on the ends for wheel splash and between the rivet lines on the panels a very thin spray of earth was applied. The underbody and trucks and wheelsets were heavily dosed with thin black for all that grunge that accumulates. They are now dirty but not overly so. The right balance for me. This Sunday past with my buddy Trevor Marshall in tow, I took my 2 nephews to visit the York Railway Modellers layout. 1600 sq ft of some of the finest modeling one can hope for. The layout is a freelance design based upon locations in South Western Ontario, with both CN and CP trains well represented. The freight car fleets are, for the most part, very accurate models of what one would expect to see on prototype inspired layout. 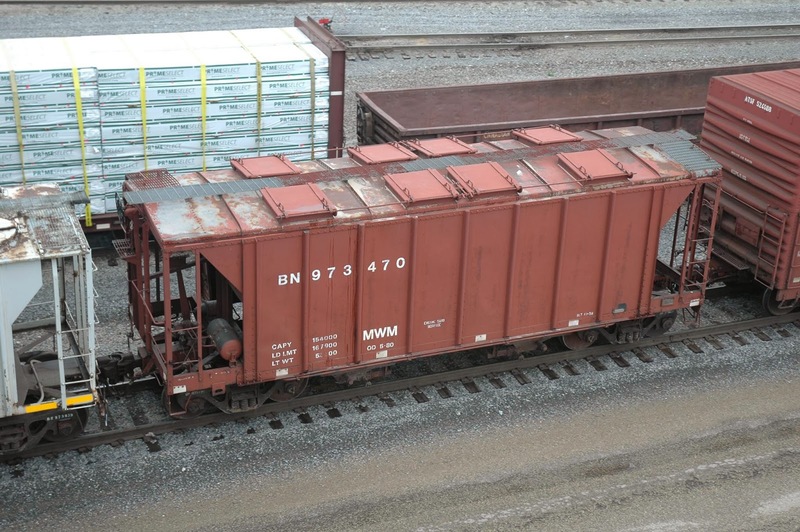 Lot's of 40' Canadian boxcars with the unique roofs, ends and ladders. The steam fleet draws heavily upon brass imports, something that Canadian Modelers were blessed with for a time. The scenery in the "completed" areas is skillfully done, as are the many kitbashed and scratchbuilt structures. This is indeed the kind of layout you would want to take a neophyte to, in order to demonstrate what is possible within the hobby. Well done to my friends at the club. I just finished these 2 O scale resin cars. Both are from the mid 1980s. Back when they were still figuring out what could and couldn't be done in resin. Both of these cars have stood the test of time. The SP Auto car was one of Chooch's early offerings. The resin is brittle and exudes a diesel fuel odour when sanded or drilled, making the process a tad unpleasant , but the details are well represented. Those are even the 30+ year old decals. The flash was rather thick and with the resin being as hard as it was I was compelled to take the model parts to the belt sander on the rear porch. But in the end a very satisfactory model results. The second car is a model of a 1932 ARA design boxcar for NC&StL made by Lee Turner. Lots of customer supplied after market parts were applied to this car, as you can see. It's waiting for paint because I've decided to try a new paint line. Tru-Color have taken over the old Accu-Paint line and have added a array of freight car colors that are meant to be accurate versions of prototype road colors. So I've decided to try out their colors on this car and a ATSF Bx-12 from SC&F that I'm building right now. Stay tuned. In part inspired by the S scale 8 hatch reefers and as part of the ongoing stocking of Manifest #402, I've built 4 F&C HO 8 hatch reefers for my fleet. Armed with knowledge gleaned from the car history included in the S scale kit I altered a number of details in the F&C kit. The bracket grabs were upgraded to Kadee bracket grabs and the kit ladders were replaced with 8 rung ladders with integral stirrups offered by Des Plaines Hobbies. For brake levers I used my etched levers and Tichy turnbuckles were cutoff and used to replicate clevis' on the brake rods. You will note that the reservoir is in an unusual position. This is correct for the early series of CN reefers and 40' boxcars. I also made all my own mounting brackets for the brake components from styrene. The braces for the heater were fabricated from strip brass. The most involved detail change was for the hatch rests. You'll see that there's a pair of little angles attached to the carlines of the roof for each hatch. The kit does include cast resin parts for this, but they're a tad lumpy and there isn't enough of them. Each car requires 16, the kit had only 14. So I made my own. To insure that I wasn't caught short I made 80 hatch rests. 80 pieces of 1x3 6" long and 80 pieces of 1x6 6" long. Glue them together in an L and attach to the roofs. But they look good, so I don't regret the effort. The car body was painted with CN Grey #11 and the floor was painted with CN Red #11. The cars are waiting for decals. I had purchased 4 sets of decals from Black Cat Publishing, but do you think I can find them? So I reordered which means the errant decals will surface any day now. And there's lots of other things going on here as well. Pictures and posts as projects get completed. Now back to removing the 2' of snow that was placed in my driveway last night. Make my job a pleasure. These 3 cars are O Scale Chooch resin kits. Sadly no longer available, but they do show up on Ebay and at swap meets. The FGEX reefers are particularly stunning pieces. Jim Zwernemann, who did the original patterns for this kit, did a stunning job. The T&G plank sheathing shows the lighter middle groove in the 1x6 plank, suggesting 2 1x3 planks. My friend Bill Welch is working on replicating this in HO scale for an upcoming project. Custom ladders and other Delrin parts were created and cast for this reefer as well. The Soo Line sawtoothed Fowler is a long time favorite of mine. Both the prototype and the models. Again another very well executed offering from Chooch. While the Chooch line is no longer sold, Southern Car & Foundry is working at offering O scale resin kits, as is Rails Unlimited. Good thing I'm well set with HO scale. O scale gets tempting at times.